Both Washington State and federal regulations require trucking companies to follow vehicle and equipment safety standards and hazardous material practices. The law requires trucking companies to maintain accurate records of all maintenance for review in the event of a vehicle inspection by the state patrol or other governing agency. Because of increased size, heavier loads and sometimes dangerous nature of the materials being transported, trucking accidents caused by mechanical errors can cause catastrophic injuries and even death to others on the roadway. The Federal Motor Carrier Safety Administration (FMCSA) conducted a large truck crash causation study which found that truck brake failure was involved in over one fourth (27 percent) of all large truck crashes. Tire problems were also identified as issue in three percent of crashes. Crashes resulting from mechanical problems are almost completely preventable with a proper vehicle inspection and maintenance program. 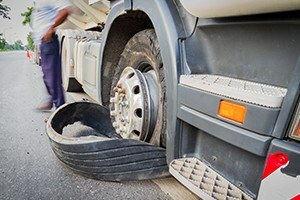 If a trucking company fails to properly maintain its vehicles, the company is generally held responsible under the law for any injuries or other damages caused by any mechanical problems resulting therefrom. At Kraft Davies, PLLC, we provide diligent and effective advocacy for victims of trucking accidents and their families. When we investigate a liability case, we take time to identify all responsible parties, whether the truck driver, the trucking company, or a third party such as a negligent manufacturer. By identifying all responsible parties, our clients are in a better position to obtain maximum compensation for their injuries and losses. Just as truckers deliver goods all over Washington, we handle cases across the entire state. Wherever necessary, we will travel to other regions to visit the scene of the crash as part of our investigation. Our attorneys thoroughly examine truck driver logs and company records to pinpoint the exact factors which could have led to a mechanical failure. When necessary, we work with the industry experts to identify and verify evidence. We will also speak with your doctors and may consult with vocational experts about your post-recovery employment options to determine the full impact of your injuries. Our goal is to build a strong case from the very beginning to ensure you receive the compensation you are entitled to. At Kraft Davies, PLLC, we carefully select trucking accident cases to ensure our resources are given to those who most need our assistance. That is why we offer a free consultation at no obligation for every client so you can determine if our Seattle-based law firm is the right fit for you. With extensive experience in handling trucking accidents throughout Washington State, we seek to empower clients to make informed decisions that protect their interests. If you or a family member was injured in a trucking accident anywhere in Washington, including Seattle, Tacoma, Everett, Bellingham, Spokane, Vancouver, Olympia, Yakima, Shelton, Port Angeles, Hoquiam or the Tri-Cities, including Richland, contact us at 206.624.8844 for a free consultation.